The kitchen island has become so popular that it’s difficult to find a modern kitchen that doesn’t have one. According to the United States National Association of Builders, nearly 3 of every 4 homeowners considers a kitchen island to be a must-have. Aside from being a great design element, they are incredibly functional, they can be storage units, cooking spaces, prep workstations, locations for creativity, spaces for homework and family time and of course a great space for dining. Before you begin, decide what your kitchen will add to your home and your family, for example: Will the island be used primarily as a breakfast nook, or the main dining area? Or will it be used for dining at all? Have a clear conversation with your kitchen designer to determine what is best for you and your family. Let’s explore some tips that will make sure your kitchen island will work perfectly for your home. The “kitchen work triangle” - albeit an imaginary one —has always been an important element of a kitchen's design and functionality. · The sum of the work triangle's three sides should not exceed 26 feet (8m), and each leg should measure between 4 and 9 feet (1.2m – 2.75m). · The work triangle should not cut through an island or peninsula by more than 12 inches (30cm). · If the kitchen has only one sink, it should be placed between or across from the cooking surface, preparation area, or refrigerator. · No major traffic patterns should cross through the triangle. · Efficiency is the triangle's main goal, as it keeps all the major work stations near the cook, without placing them so close that the kitchen becomes cramped. The work triangle is also designed to minimize traffic within the kitchen so the cook isn't interrupted or interfered with. Size matters - if the island is too big, your kitchen will feel cramped. If the island is too small, it may not be very useful. The general rule is to allow around 39in – 48in (100 - 120 cm) of open space around the island. Additionally, any island less than 24 inches (60 cm) wide should be avoided altogether. 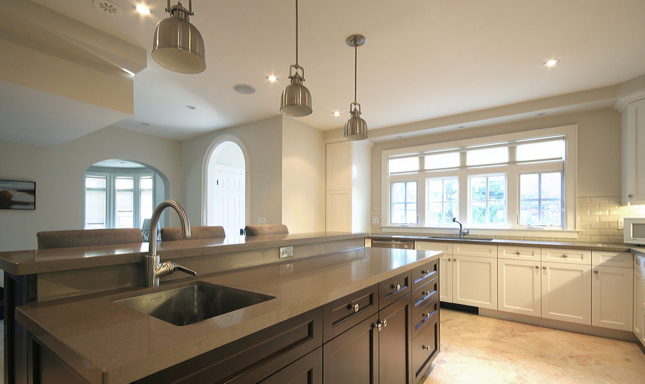 Look at our gallery of kitchen renovations we completed in the Toronto area to inspire your next project. The standard height for a kitchen island counter is just a hair over 36 inches (90cm). If you intend to turn your kitchen island into a bar, then you may want to add 3 inches (10 cm) or more. Though that is the standard, it is not advised for everyone. Ideally, the island countertop should be 2 or 3 inches (5 – 8cm) lower than the elbow of the main user. Your kitchen island may be where most of your prep work will take place. Ensure the lighting will allow you to properly do the task at hand, whether it’s the fine work of cake decorating or coarsely chopping vegetables, reading recipes or entertaining. Make sure your lighting solutions includes dimmers. Be careful to not cram too many seats into your kitchen island bar. Make sure there is enough space approximately 24” – 30” (60cm – 76cm) per person, there may be other factors but, the most important is that anyone can sit comfortably with ample room for elbows. Looking for more tips to create the best kitchen possible? Read our previous kitchen renovation blog “Kitchen Confidential - 4 Ways To Refresh Your Kitchen”. If your island has a cooktop, it will require a ventilation system. Without proper ventilation, your favourite fish dish could end up wafting through your entire home. You have a choice between a traditional range hood, which could disrupt sight lines in your kitchen or you could opt for the clean lines of a downdraft ventilation system. As you see, there are several elements that go into making an ideal kitchen island. The professional designers at Bryant Renovations are up-to-date on all the kitchen island design trends, and they can help you identify your needs and translate them into an efficient plan that fits your life style and work style. They will also unlock several other kitchen island design opportunities, like new storage solutions, different island shapes, and other features that you may not have considered. Contact the Toronto kitchen renovation and design experts at Bryant Renovations today to discover new kitchen island designs that will completely change how your feel about the heart of your home.